Home / Books / J.P. Adrian / KPop and Culture Fest / Lifebooks / The K-Pop Star and I / Wattpad / The K-Pop Star and I is Pop-bulous! The K-Pop Star and I is Pop-bulous! Sorry for the lame use of ‘pop’ and ‘fabulous’ but that’s how I would like to describe yet another Pinoy made novel borne online, specifically Wattpad. 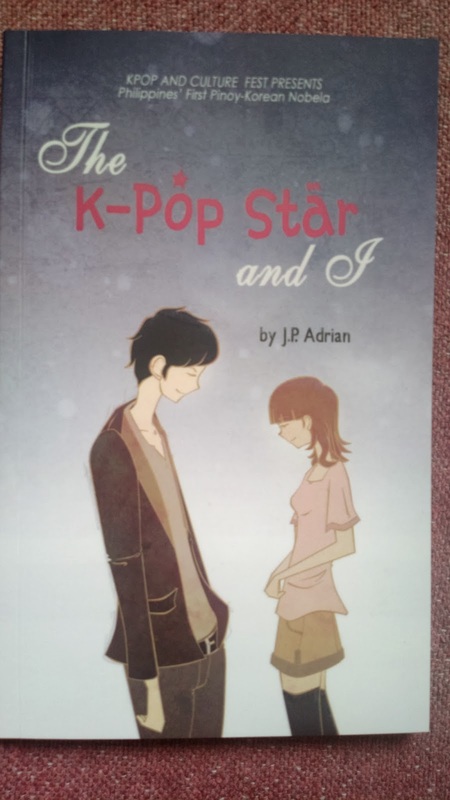 This time, it’s from J.P. Adrian, was published by Lifebooks, and presented by KPop and Culture Fest. K-Pop Star and I is supposedly the first ever Pinoy-Korean novela, although She’s Dating the Gangster from Summit Books also claim the same tagline. Between these two books, however, I enjoyed the former more simply because the latter’s ending is awfully sad. This pop-bulous book is refreshingly from a male writer yet was mostly written from the female character’s point of view. It features Joy Natividad, a newbie PR consultant working for an agency hosting a Korean pop star’s secret visit to the Philippines. Joy, who was described by her Sir as an “auntie-looking” transformed slowly and her client eventually fell in love with her during his personal trip to the Philippines in search for his dying grandmother’s long lost love. Unlike the sad fate which befell his grandmother, the K-Pop star in this book at least followed his heart and fulfilled his promise to Joy, even if he hadn’t contacted her for months when we was forced to leave, else fans would swarm him. His disguise was revealed when he ran after Joy at the hotel without his glasses and cap. But more than that, people were already there eyeing him because of Love, Joy’s little sister who is a major KPop fan and is even a member of Joy’s Sir’s fans club in the country and watched his concert here a few years back. Speaking of Love, there was a minor issue with the book concerning the sisters age. Supposedly, the sisters were 11 and 5 respectively when their parents died and yet fast forward to the present, Joy is 21 and Love is 18? Anyway, it’s only a minor lapse. The rest of the book including the love story’s progress is worth the applause. It’s amazing how a guy can be sensitive enough to write something as romantic as this book. I love how the legend of the flower Dama de Noche was somewhat connected to this couple’s romance. So Sir’s lines, “don’t turn into a flower” was quite unforgettable. He wrote those on his note for Joy before hastily leaving the country. He asked Joy to wait for him and surely she did even after what almost seemed a year. His interview where he announced about taking a break from the entertainment world for his love (whose photo was flashed on screen and name was mentioned by the K-Pop star) was all over YouTube. Joy was the last to see it and she became an instant celebrity again the way she did months back when their photo kissing each other at the hotel lobby was exposed all over the web. But that’s enough of teasers. All in all, The K-Pop Star and I is indeed pop-bulous!